The American burying beetle, (Nicrophorus americanus) Oliver is a member of the carrion beetle family Silphidae. Carrion beetles, as their name implies, are an important part of a vast host of scavengers that are responsible for recycling decaying materials back into the ecosystem. They are also referred to as burying beetles or sexton beetles. There are 570 species of silphids found worldwide, and 31 of them occur in North America. There are 18 species in Nebraska. The American burying beetle has been recorded historically from at least 150 counties in 35 states in the eastern and central United States, as well as along the southern fringes of Ontario, Quebec and Nova Scotia in Canada. Collecting records indicate that east of the Appalachian Mountains the American burying beetle declined in a generally north to south direction, and the decline was well underway, if not complete. by 1923. West of the Appalachians, the decline occurred later. In the Midwest, the decline appears to have proceeded generally from the center of the range outward, with all collections since 1960 occurring at the peripheries of the range. The American burying beetle is now found in only six states: Nebraska, Rhode Island, Oklahoma, South Dakota, Kansas, and Arkansas. There are now ongoing attempts to reintroduce it into Ohio and Massachesetts. The earliest record for the American burying beetle in Nebraska is 1921, although it undoubtedly occurred here before that time. They were again collected in 1957 and have been sporadically recorded since that time. The westernmost North American record for the American burying beetle is near North Platte, Nebraska. The most recent sightings (1992-1997) are from Lincoln, Dawson and Cherry counties. The available information suggests that this species occurs rarely and locally, primarily in undisturbed areas in the eastern two-thirds of the state. The American burying beetle is the largest carrion-frequenting insect in North America; it may reach a length of l l/2 inches. Like many other carrion beetles in the genus Nicrophorus, it is shiny black and distinctively marked with two bright orange bands on each wing cover. Unlike any other species, however, the pronotum (the shield-like area just behind the head) of the American burying beetle is also orange, and there is a small orange patch on the face between the eyes. While Nebraska has 11 species of Nicrophorus, only the American burying beetle has the orange pronotum, and it can be readily distinguished from the other, more common species. Adult beetles are nocturnal and, search widely for carrion. They are remarkably adept at detecting the odor of recent death. Using the organs of smell located on their antennae, they can find a dead mouse within an hour of death and from as far away as two miles. After flying to the vicinity of a carcass, they drop to the ground and crash through the litter to it. They go under the body, turn over onto their backs and experimentally lift the remains. 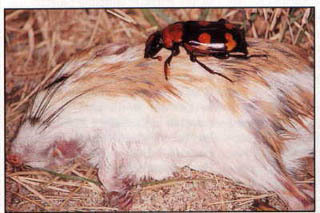 A male/female pair may move mouse-size remains several feet until a substrate soft enough for burial is found. It remains unknown how a pair of beetles can "agree" on a burial site or how they are able to keep the carcass moving uniformly in one direction. The soil at the burial site is loosened by "plowing" through it in much the same fashion as does a bulldozer. Soil is moved upward and crumbles, and roots are chewed through. Gradually, soil from beneath the carcass is displaced to the side, and the carcass settles into the ground and is buried under several inches of soil. Immediate, nocturnal burial is important because it prevents flies, active during the-day, from laying eggs on the remains. After burial, the beetles strip away fur or feathers and work the mass into a compact ball. They will then "inoculate" the remains with secretions that preserve the carrion and modify the course of decomposition. The female constructs a short chamber above the carrion in which she lays from 10 to 30 eggs. Returning to the carcass, she prepares a conical depression on top of it. Both parents regurgitate droplets of partly digested food into the depression. The fluid accumulates as food for the larvae that hatch in a few days. The larvae receive parental care during the entire time they are feeding and growing. This is an extremely rare and highly developed behavior in insects, a condition normally found only in the social bees, wasps, ants and termites. Both adults regurgitate food to begging larvae. The larvae grow rapidly and are soon able to feed themselves. The adults continually tend the carcass, removing fungi and covering the carrion ball with an antibacterial secretion. Sometimes the size of the brood is too large to be successfully reared on a small carcass, and both adults will cannibalize small larvae. After about a week, the larvae have consumed all but the bones of the carcass, and the adults fly away. Living only one season, the adults soon die. The young pupate in the nearby soil and emerge as adults about a month later. Overwintering is in the adult stage. Of principal importance to the beetles and their young is burial of the food resource, which effectively removes it from the arena of intense competition by maggots, other carrion-feeding insects and even mammal scavengers. Carrion is an ephemeral, unpredictably encountered food source, and its "bonanza" nature is so valuable to the prospective parents that they bury it to keep it from being stolen. Burying beetles are unique among the silphids because they break the cycle of competition at the food source and provide their larvae a considerably safer, relatively predator-free subterranean environment in which to develop. Considering the broad geographic range formerly occupied by the American burying beetle, it is unlikely that vegetation or soil type were historically limiting. Today, the American burying beetle seems to be largely restricted to areas most undisturbed by human influence. In Nebraska, the Sandhills is just such an area, and it is there that the beetles have been recently rediscovered. Gothenburg, Brady, North Platte and the Valentine National Wildlife Refuge are all locales in which beetles are now found. Contrary to the earlier belief that the insects were associated with eastern deciduous woodlands, it now seems that carrion availability (appropriate in size as well as numbers) is more important than the type of vegetation or soil structure. Habitats in Nebraska where these beetles have been recently found consist of grassland prairie, forest edge and scrubland. Specific habitat requirements are unknown. There are perhaps fewer than 1,000 individuals in the only remaining population east of the Mississippi River, and the Oklahoma and Arkansas populations (currently being inventoried) are of uncertain size. The size of the Nebraska population is also unknown, but fewer specimens have been sighted here than elsewhere. The cause for the decline of the species is complex and difficult. However, in order to implement an effective recovery program and to locate additional populations, it is necessary to understand the possible factors influencing the decline. The prevailing theory explaining the disappearance of the American burying beetle involves habitat fragmentation. Fragmentation of large expanses of natural habitat changed the species composition and lowered the reproductive success of prey species required by the American burying beetle for optimum reproduction. Fragmentation also resulted in an increase in edge habitat that supported and increased the occurrence and density of vertebrate predators and scavengers such as crows, raccoons, foxes, opossums and skunks, all of which compete with the burying beetle for available carrion. Fragmented habitats not only support fewer or lower densities of indigenous species that historically may have supported burying beetle populations, but there is also now a great deal more competition for those limited resources among the "new" predator/scavenge community. Determining a single cause for the decline of the American burying beetle would simplify and facilitate its recovery. Unfortunately, the decline is probably the result of an interplay of several complex factors that include (1) artificial lighting tha decreases populations of nocturnally active insects, (2) changing sources of carrion because of habitat alteration, (3) isolation of preferred habitat because of land use changes, (4) increased edge effect harboring more vertebrate competitors for carrion and (5) the possibility of reduced reproduction because of some genetic characteristic of the species. The U.S. Fish and Wildlife Service, in cooperation with the scientific community, has formulated a recovery plan that is now being im- plemented. Surveys at several places in the eastern United States are being conducted to find remnant populations so they can be protected from land development authorized or funded by state and federal agencies. The search for remnant populations is now the primary activity in Nebraska. The populations in Rhode Island and Oklahoma are being monitored, and the habitats there are being managed to prevent any disruption that might be harmful. Beetles are being reintroduced in Massachusetts from a laboratory colony at Boston University, and other introductions are planned. Ideally, we would like to establish a laboratory colony in Nebraska from which reintroductions could be made. Life history studies are being conducted in order to determine possible factors responsible for the decline of the species. Similarly, DNA studies are ongoing to ascertain what, if any, genetic differences exist among the known populations. Knowledge of those differences could be important for future breeding programs. Finally, a public education program has been developed to increase awareness of the importance of this unique insect. There is now an ongoing, unprecedented loss of wildlife species diversity throughout the world as well as a decline in the absolute numbers of organisms from the smallest microorganism to the largest mammal. The current loss of biota has several causes. One is the destruction, conversion or degradation of entire ecosystems, with the consequent loss of entire assemblages of species. Another is the accelerating loss of individual species within communities or ecosystems as a result of habitat disturbance, pollution and overexploitation. Third and more subtle is the loss of genetic variability. Selective pressures such as habitat alteration, the presence of chemical toxins or regional climate changes may eliminate some genetically distinct parts of the population, yet not cause extinction of the entire species. Why worry about one insect that most of us have never seen? The World Wildlife Fund perhaps said it best: "All that lives beneath Earth's fragile canopy is, in some elemental fashion, related. Is born, moves, feeds, reproduces, dies. Tiger and turtle dove; each tiny flower and homely frog; the running child, father to the man and, in ways as yet unknown, brother to the salamander. If mankind continues to allow whole species to perish, when does their peril also become ours?" The endangered American Burying Beetle, Nicrophorus americanus, formerly occurred over the eastern half of the United States but is now found in only six states. Southcentral Nebraska has one of the largest populations remaining in the country. Jon Bedick, working under the supervision of Dr. Ratcliffe, conducted research on the occurrence and ecology of the endangered American burying beetle in Nebraska. Jon graduated from UNL in May 1997 with a Masters degree in the Department of Entomology and is currently developing several papers for publication in scientific journals from his thesis. He was accepted into a PhD program in the Department of Entomology where he will be working in the area of insect physiology. Jon and his research on the American burying beetle were recently featured in an article "In Search of the Endangered American Burying Beetle" in Nebraskaland magazine (October 1997). Citation: Ratcliffe, B. C. 1997. Endangered American burying beetle update. http://www-museum.unl.edu/research/entomology/endanger.htm.